I am on United 1126, flying from Denver to Anchorage, the first leg of the long awaited trip to Nome and Gambell. I have dreamed about this trip for years, and it is finally begun. Karen made the wise decision to stay behind, as this trip will not live up to her expectations, in terms of accommodations. More importantly, this trip can be intense, from the long hours of birding (virtually no darkness this time of year). This is presumably a trip for serious birders, and it will be fascinating to meet the group, which totals 14, plus two guides, including Kevin Zimmer, who was our guide last year in Panama. I will be arriving mid-afternoon in Anchorage, and will be met by Lynn Barber, who moved up here from Rapid City last year. Lynn and I will be able to do some birding together in the Anchorage area late today and tomorrow, before my appointed meeting with the rest of my group, at 6:30 as the Coastal International Motel. What are my goals for this trip? They are multiple. The most obvious goal is to experience this adventure. 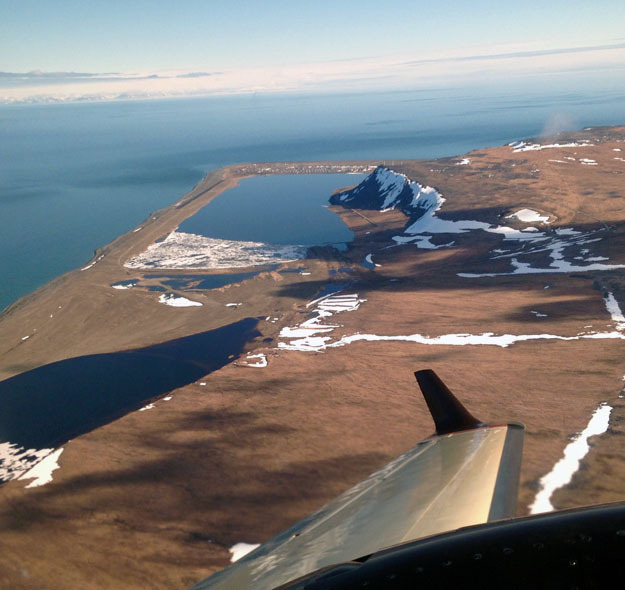 Gambell is a native village of subsistence hunters, located in the Bering Sea, 42 miles from Russia, which you can see on a clear day. There are no services on the island, and we will be staying at a community owned property built to house the crew that lived here during the construction of the airstrip. The appeal of Gambell is that becomes of the proximity of Asia, vagrants inevitably find themselves blown here, and it has been the sight of numerous first North American sightings over the year. By looking at eBird over the last few days, I have seen that the following birds, none of which I am ever likely to see anywhere else, have been seen in the last week: King and Stellar's Eider, Crested and Least Auklet, Dovekie, White and Eastern Yellow Wagtail, Wood and Rock Sandpiper, Common Greenshank, Emperor Goose, Tundra Bean-Goose, McKay's Bunting, and Wandering Tattler. Who knows? Add to this the good possibility of other birds, not yet seen this year, like the Spectacled Eider, Bristle-thighed Curlew, Bar-tailed Godwit, Northern Wheatear, and Bluethroat, and I should very well get the 8 life birds I need to hit 600 for the ABA region. Personally I would like to see 15 lifers. I also expect to easily go well over 100 species total for Alaska. I go into this trip at 94, from the trip Karen and I took in 2010. I also want to add new year birds, as I hope to have a good total for the year. I have been close, but never seen 400 ABA Species in a single year. Other goals for this trip are to try to write regularly in this accounting, and to document my trip with photographs, both of the birds we see, as well as the habitat. I have a new hookup for my camera, which should make it available to me when I need it. The bird count will not be overwhelming, as it was in the Neotropics last year, so perhaps I will be able to spend more time capturing images. It is clearly something that I would like to be better at. 2015-06-02 - Today I had planned some miscellaneous birding around Anchorage with Lynn Barber, but the day dawned rainy and gray. We gave it a bit of a chance to clear up, but when that didn't happen, we modified our plans. After stopping at Cabella's to pick up a rain hat, and a poncho that would fit over my ski jacket (for Gambell), we headed south and stopped along Potter's Marsh, where we were able to get great views of Mew Gull and Arctic Tern. Later, on the boardwalk we got great views of the flight of the ArcticTern which is described as "a buoyant, graceful flight with steady wing beats". Perfectly accurate. I also added a pair of Ring-necked Ducks to my Alaska life list. We stopped in Girdwood for some gas, and saw a Northwestern Crow, which you can't find in Anchorage, but are common in Seward. Then we went toward the Portage Junction, where we headed to the Visitors Center, where there were small icebergs in the lake. On the way, we stopped at a turnout and heard several Varied Thrushes, and saw a Wilson's Snipe and an Orange-crowned Warbler. Near the Visitor Center, we had lunch at a little cafeteria that had hummingbird feeders. This is the extreme northern limit of the Rufous Hummingbird. Their summer range extends as far South as Yellowstone National Park. During lunch we saw a beautiful male three times, much darker than the fall birds that we see in South Dakota. I am now at the Coast International Motel, across from the Anchorage airport, where the Tour begins in about two and a half hours. Tomorrow is a travel day with a 10:20 flight to Nome, transferring to a smaller plan to Gambell. We will have to limit our luggage to 50 pounds, which means that I will need to find about 15 - 20 lbs of gear to leave behind in Nome. That will be interesting. That's it for now. 2015-06-04 - We have just completed our first full day on the island. What a 36 hours! The weather was mixed. On the positive side, it was warmer in Nome than it was when we left Anchorage. On the negative side, the forecast called for winds from 25 - 40 MPH, from the north, not a good indicator for birding on the island. Nonetheless, it did provide us with the opportunity for an early flight, and we landed in Gambell around 3:15. On the way in, we could clearly see the mountains of Siberia, 45 miles or so to the north of our location. The wind was brutal, and we slowly made our way to the "lodge", through the pea gravel that is not easy to walk in. Fortunately, I had followed the recommendations of Kevin Zimmer, and purchased a pair of NEOS overboots, which I wear over normal running shoes. After quickly getting settled in, we "geared up", and made our way outside. The village of Gambell has no vegitation. Many of the homes are ramshackle, and its easy to see the impact of the sea air on the homes. The pea gravel that forms the foundation is a little difficult to get around with, but several years ago, they put in some hard packed gravel "roads", which are easier to navigate. We made our way toward the beach, first going through the "boatyard", an area with some grass, in which there are many boat hulls that have either never been fully constructed, or are in the process of decay. Once we reached the beach, the impact of the extreme winds were evident. It appeared to me that the winds were in the neighborhood of 40 mph. And because they were from the north, they brought the colder air from over the pack ice. And instead of going to the Point, we were a bit south of there facing more to the west. The bird activity, despite the winds, or perhaps because of the winds, was fantastic. It takes a bit to adjust to the constant flow of birds along the shore. First of all were the alcids. These are typically relatively small birds that are typically flying in groups, and moving very fast. They never seem to be taking it easy, but rather seem to be flying as if their lives depended on it. There are three different Auklets here, Least, Crested, and Parakeet. The Crested certainly are in the majority, at least from the beach. They first appear to be shadows, totally dark, although not quite black. Upon closer examination, or just more exposure to them, you can see the orange on their bills. The Parakeets, much lower in number have a bit more contrast, with larger orange bills, and white bellies. As a result they appear quite a bit larger, although they are in fact 9'' for the Crested and 10" for the the Parakeet. This afternoon, we didn't see any of the Leasts. Also in evidence, of course, are Gulls. The predominant species here is the Glaucous Gull. It is a beautiful bird in its own right. Large, stout,and mostly white. More plentiful again is the Black-legged Kittiwake, a bit smaller than the Glaucous, and with Black wing tips and black legs. These too have basically white upper wings. A larger gull is the Vegas subspecies of the Herring Gull. These have darker wings. Also seen is the Sabine's gull, that has a very recognizable, but difficult to describe pattern on their wings. The real target gull is the Slaty-backed Gull, which has jet black wings with a significant white trailing edge. Periodically, several Pelagic Cormorants would come through. They are almost totally black, almost an oily dark green glisten, with pencil-like necks. At times, we would be treated by some White-winged Scoters, an ocean duck, as well as Long-tailed Ducks, Harlequin Ducks, and even a stray Pintail. Eiders usually steal the show, when they come through. These include the Common, which I often see of the New Jersey shore, the King, which can sometimes be seen along the Oceans during the winter, and the real prizes, Steller's and Spectaled. 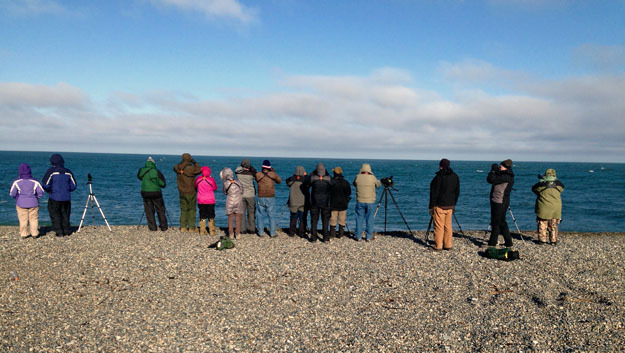 During this first session of sea-watching, we don't see any Eiders, and the best birds are a pair of Arctic Loons, which are a life bird for me, and a first year Slaty-backed Gull, distinguishable by its stout black bill, and dark tail. We also made our first trip through the "bone yards" where centuries of hunted sea mammals have been discarded to rot. These nutrient rich areas, resulting from the decomposition of the organic matter, become hiding grounds for skulking vagrant birds. They are typically surveyed regularly to see if anything interesting has been in hiding. Typically the two most often seen birds are Snow Bunting and Lapland Longspur. While both these birds are routinely seen in South Dakota, I had never seen either in breeding plumage so even seeing these routine birds is a treat for me. After our first dinner, we went back to the Seawatch, where we saw a group of about 12 King Eiders heading north. Walking around a bit, we discovered a beautiful adult Slaty-backed Gull, to go with the juvenile that we saw earlier, and we also were able to spot another Sabine's Gull. The plan for the first full day called for another visit to the Seawatch. Bundled against the cold, we made our way through the pea gravel to the beach, where the wind was still very strong, and the temperatures cold. Bird activity was still excellent. We picked up a Parasitic Jaeger soaring over the water, made our first definite identification of Least Auklet, spotted a handsome Red-necked Phalarope among a group of Red Phalaropes, but the highlight of the seawatch was getting a group of three Yellow-billed Loons flying over in the brilliant sunlight, being able to clearly see their yellow bills. Just great. After lunch we had a very nice afternoon of birding south of Lake Troutman. We started by identifying a Wood Sandpiper, a true Asian vagrant, which had settled in to the marsh at the northeast corner of Troutman Lake. We were to see it for the next three days. At this point, we hear reports of a Lesser Sand Plover south of the Lake, and we quickly arranged for motorized transport, in the form of the ever-present ATVs, which are the only form of motorized transportation, unless you count the nuts who ride motorcycles in this gravelly environment. Anyway, we arrived at a teed-up Lesser Sand-Plover, a beautiful female, who entertained a large group of us for a good 30 minutes or more. A bit further south, some effort produced another vagrant (at least a semi-vagrant, in that there have been irregular observations of Common Ring Plover nests). One of the great things about Gambell is that, in contrast to a place like Ecuador, you are not about to get overwhelmed by the number of Species or actual birds you see (with the exception of the Alcids). Therefore, you have time to prepare and enjoy each bird you see, and in some cases to really study them. So for example, we were able to see the difference between the Semi-palmated and the Common Ring Plovers; a very subtle difference in the eye-ring, and a less subtle distinction in the width of the stripes on the breast of the birds. The Ring Plover has much wider stripes. In the boneyards in the afternoon, we finally got good looks at the White Wagtail, a bird seen here regularly, but extremely difficult to find anywhere other than Nome county in the United States. It is seen regularly throughout Europe and frequently in Japan. It has a very pleasant swoopy flight path. After dinner, we did another sea watch, and then during our final sweep of the boneyards, we came across a female Bluethroat. This was my 600th species seen in the ABA area, so I was quite happy to have it be such an iconic bird. 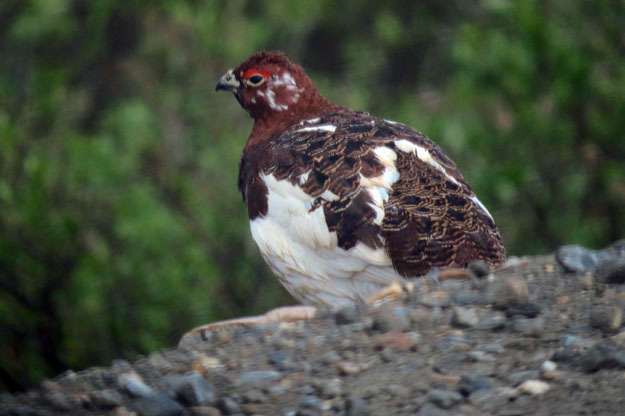 Too bad it wasn't a male, that are one of the birds everyone wants to see in Alaska. That will have to wait for later. The plan for the morning of the 5th called for us to scan the Cliffs to the east of the village, where all the auklets nest, along with some Pigeon Guillemots. The real treat here is that the very small and hard to find Dovekie is usually seen in very small numbers on the cliffs. This is where having experienced guides can really make a difference. Kevin has come here for 30 years, and knows the locations most likely to yield the Dovekie. It also didn't hurt to have Gavin Beiber and Jon Dunn on Gambell, leading the WINGS tour, staying at the same (and only) lodge. They all shared sightings by radio. Sure enough, it did not take us long to spot a couple of Dovekies, among the thousands and thousands of alcids. On the way over to the cliffs, we had seen the Wood Sandpiper again, and the scope, and sounds at the Cliffs were really remarkable. A Peregrine Falcon sent the alcids into a tizzy at one point, and we also spotted a lone Sandhill Crane, flying high over the cliffs. Good stuff. After lunch, we got ATV rides to the south end of Troutman lake, where the WINGS group had spotted some good birds in the morning. First stop was a Wandering Tattler, the first of several we would see, just south of the lake. From there, we headed to the far south end of the un-named lake to the south of Troutman Lake. There was a double bonanza to be seen here. A Red-necked Stint, a good, but regular visitor to Gambell, and a Terek Sandpiper, described by Kevin Zimmer as "like being constructed of spare parts”. It is only seen one in five years, making this a bird of special interest. Although it was at some distance, it gave us good scope views over a fair amount of time. Somewhat overlooked with most of the attention being paid to the vagrants, we were also treated to wonderful views of Red-necked Phalaropes, and Western Sandpipers, along with more Long-tailed Jaegers. It was a long afternoon, with another Sea Watch before dinner, and I was thinking about taking it easy that evening, but once we got back to the Inn, we heard reports of a Sky Lark being seen near the airstrip, in the boneyards. So I rallied, hoping we would succeed quickly in finding our prey. My legs were already pretty sore, but I couldn't resist. "When will I be back here again?" So a number of us headed out to look for the Sky Lark, a Eurasian vagrant. Although we did see it after a bit of searching, we didn't get great looks at it, so we headed north in the boatyard, to see if we could find it again. This took longer than I had hoped, and by the time we got great looks at Rock Sandpiper, another lifer for me, I was really dragging. We were working our way back toward the airstrip, and my back was really painful, so I headed back to the Inn. As it turned out, the few who remained after I abandoned the search did get additional looks. Oh well. That evening, others found a great bird in the Circular Boneyard, near the Far Boneyard at the Northeast corner of the Lake; a "Siberian" Common Chiffchaff. 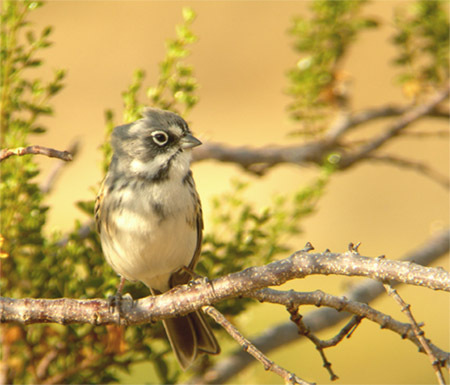 Kevin had recorded the first NA record of this bird here in 2012, and it had been seen each year since then. So it was shaping up that our last full day on the Island would be spent trying to "clean up" (see the few remaining species that we hoped to see) at the Sea Watch, and then search for the Chiffchaff. The Sea Watch was relatively disappointing, in that we did not see either the Emperor Goose, or the Spectacled Eider, but you really had to keep telling yourself, "When is the next time I will see these three auklets, both Puffin species, Red Phalaropes, Pigeon Guillemots ", etc. But by mid-morning, we were all primed to get going on the Chiffchaff. So after a brief stop at the Inn for refreshments, we headed over to Marsh, where the Wood Sandpiper was on display again. We then went through the Far Boneyard, with nothing other than Gray-cheeked Thrushes and Hoary Redpolls being seen. The Chiffchaff had last been seen in the Circular Boneyard, and seemed to be going back and forth between there and the base of the cliffs. We had about 17 people, and decided that we would come the Circular boneyard from all directions at once, very slowly. It took a little while to surround the Boneyard, and then we proceeded to move slowly toward the center of the area. We were probably half way through when a small song-bird was flushed. It stayed in the boneyard for a while, and over a period of perhaps 20 minutes, the group got progressively better pictures of the bird. Finally it flew off toward the Cliffs, and the group was able to celebrate. This was clearly the most rare bird we had seen to date. It turned out to be the 5th North American Record of the Chiffchaff. It's tempting to say that the afternoon was anti-climactic, but with such great birds as Wandering Tattler, Rock Sandpiper, Common Ringed Plover, Terek Sandpiper (again), and finally a good look at Eastern Yellow Wagtail, that would be crazy. Back to the lodge, for dinner, and then we began to pack up for our departure the next morning. It turned out our flight was a little earlier than I would have expected, but it worked out well. 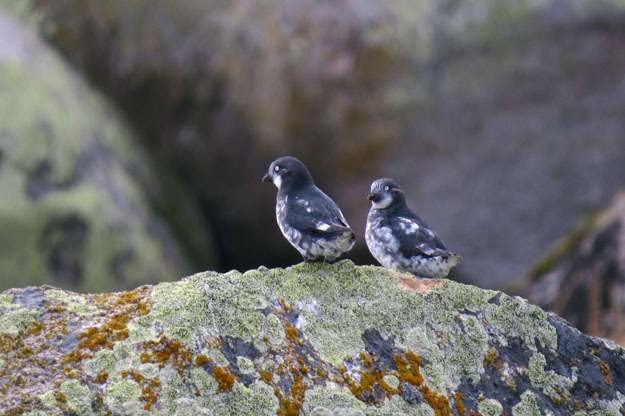 We saw most of the birds we were likely to see, and getting to Nome early meant we would have more time to explore there, where we could expect a whole new group of target birds, as well as significantly larger numbers of birds. We were pumped. Sunday dawned beautiful. The sky was blue, the winds were non-existent, and the temperature felt like a balmy 50F or so. Our flight to Nome was uneventful, and it was a little dissapointing to find that the good weather did not extend to the Mainland. Instead it was in the 40s, dark, and a little rainy. We sorted out our gear at the airport, and made our way into "downtown" Nome, where our accommodations at the Aurora Inn where quite comfortable, and in comparison to Gambell, downright luxurious. No roommates here, I got my own large room, WITH MY OWN BATHROOM! After a not so quick lunch at "almost" the only place to eat in town, Airport Pizza, we headed out on the Council Road, that initially follows the coast to the east toward Safety Sound. One thing became quickly evident. There were a whole lot more birds to be seen here than on St. Lawrence Island. This part of Alaska is a conversion point for migrating birds from many different areas. Birds that breed here, winter in North America, South America, Africa, Europe, and Asia. The first thing I noticed on the way out the Council Rd. was that there were Loons everywhere. Every little pond seemed to have a pair of Red-throated Loons, not the ones that I've seen on the Jersey Shore, similar to winter Common Loons, but in full Breeding Plumage. Wow. And Pacific Loons, which have these gorgeous silvery necks and heads. We also see an unusual number of Jaegers, a large bird that is extremely rare in South Dakota, but we pass one mountainside where we can count about 25 of them, largely Long-tailed. At about this time, we pull over, as Kevin spots a Willow Ptarmigan, a lifer for me, in the bushes alongside the road. Approaching Cape Nome, we drive along a cliff, maybe a hundred feet above the sea, and are treated to an amazing collection of Jaegers, all three species, who are harassing a group of perhaps 500 Black-legged Kittiwakes, who are feasting on fish in the area. The Jaegers chase the Kittiwakes that have managed to snag a fish, and keep at it, until the Kittiwake either drop the fiss.h, or regurgitate the already swallowed prize. Kevin said this was the largest single grouping of Jaegers he has seen here, and we are treated to a great study of the differences between the Pomeraine, Parasitic, and Long-tailed Jaegers, and are also able to identify dark-morph varieties of at least the first two species, which are relatively less often seen. We drink in this scene for a good 20 minutes, at least. We slowly explore the shore, but the seaside, as well as the sound, and the birds are plentiful. Eighteen Sabine's Gulls, sharing a beach with Mew and Herring Gulls. Eight Surfbirds, along with a Black Turnstone, a Dunlin, some Sanderling, and Western Sandpiper. Great comparative view. Other highlights include my first good look at Eastern Yellow Wagtail, the familiar Short-eared Owl, and a good-sized group of Sandhill Cranes, including young that we rarely see in South Dakota. After reaching the deserted mining town of Solomon, we turn around and retrace our route back to Nome, where we have a late dinner, and back to the Hotel around 10:45. The next day, our first full day in Nome, we have a full agenda. After a not so quick breakfast, we head out the same Council Road. Our target this morning is Gyrfalcon, which we have heard have set up a nest on the second bridge after Solomon. In the afternoon, we will head out the Teller "Highway", looking for a variety of new birds. Very little wind this morning, which is nice. As we head out on the now-familiar road, our first stop is at the mouth of the Nome River. There was not much to be seen here yesterday, but today we spot one of my target birds for Nome, the Bar-tailed Godwit. A small group of them give us good scope views. We also see some Red-necked Grebe, and a mixed group of Semipalmated and Western Sandpipers. Once again watching a group of Arctic Terns, we suddenly hear a different sound, and see a flyover Aleutian Tern. These terns have a white forehead, and although I "think" I saw one on our last trip to Alaska in 2010, this one is well seen, and heard. A treat. Another stop yields a very nice male Eurasian Widgeon, only the second I have ever seen. It is somewhat similar to the familiar American Widgeon, but the head is dark rufous, rather than the white and green of the American. We also find a lone Snow Goose, and a fair number of Black and White-winged Scotors, nice sea ducks. Once we pass Solomon, we begin to climb steadily, and it gets colder, and the habitats change. Apparently Northern Shrike is becoming more and more uncommon, and we get nice views of one, in the iconic tree-top perch they so often take. Grey-cheeked Thrush are seen frequently the next few days., and we also hear and then see a Northern Waterthrush, as well as Savannah Sparrow, and the ever-present Lapland Longspur. At another stop we first hear the pleasant song of the Golden-crowned Sparrow, and then see a number of these birds, that I don't believe I have ever seen outside of Alaska. 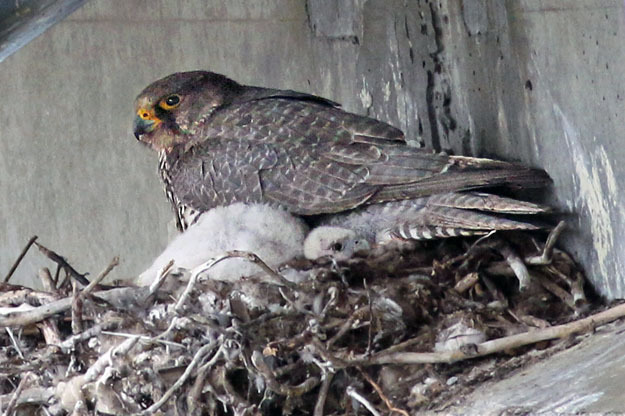 Eventually, we reach the nest of the Gyrfalcon. The adult bird is gone, but we are able to get views (not great ones), of several chicks in the nest. We continue up the road, looking for the adult, but eventually turn around and come back to the nest, where the mom is now on the nest. We stay in the vehicles, as to not disturb the birds, and get reasonably good views, as Rafael and Kevin maneuver us to give everyone a good look. Heading back, we get a good look at a Peregrine Falcon, also along the river. After a filling lunch at Subway's (as far as I could tell, the only franchise food in Nome), we headed out the "Teller Highway". The second of three major roads out of Nome, this one connects across the Seward Peninsula, to the City of Teller (pop. 263). More gorgeous scenary. Prose doesn't do it justice. Let's just say "Wild". Several highlights of the day. We got very nice views of a Rock Ptarmigan, which I managed to photograph. We followed a very rough turnoff to a quarry on the right side of the road, where we got excellent, if fleeting views of Northern Wheatear. And finally on the road to the Woolley Lagoon, we had excellent views of 3 different Plovers, Black-bellied, American Golden, and finally Pacific Golden. This last one was a target of mine. I have seen them in Hawaii, where they winter, so it was a new ABA bird for me. Their nesting habitat is so much unlike the beach, it’s mind-boggling. Not a bad life-style, Hawaii to Alaska each year. Over dinner this evening we talked about our next day's trip, my last full day, before heading back to Anchorage on Wednesday. We will drive out the famed Kougarok Road. The ultimate destination is in the vacinity of Coffee Dome, where we would attempt the infamous trek to search for Bristle-thighed Curlew. This has always been described as a difficult hike due to the footing. The area is full of tussocky grasses, that can stick up like a large mushroom. If you try to walk on it without being careful, it could easily result in a twisted ankle. Although I have often thought that these kinds of descriptions made hikes seem more difficult than they in fact are, I brought a hiking pole for this adventure. And boy, was I glad I did. In many ways, this hike was more difficult than the climb in Big Bend for the Colima Warbler. That was on a proven trail, and if you did the work, you had a better than average chance of seeing your target. Aside from the footing, which was indeed treacherous, there was not really any trail per se, and we were attempting to find what we believed to be 2 pairs of Bristle-thighed Curlews, in an enormous area.. You just never could be sure that you would actually find the birds, and you knew you had a long way to return, and you got this gnawing feeling that not finding the birds would be terribly disappointing, given the amount of effort expended. It rained almost the entire way out on the Kougarok Road, so we didn't make many stops. We did have a small group of Greater White-fronted Geese fly over us at one point, and stopped briefly for a Whimbrel, but we basically moved directly out to the point of departure for our hike. When we got there, though, there were quite a few people who were just going up the mountain, and Kevin decided that we would first look for Bluethroat, a beautiful little bird that had been seen just down the road. Although I had seen a female in Gambell (my 600th ABA Bird! ), seeing the male was something that Kevin really wanted for us, as this is really an iconic Alaskan bird, and he was the first person to find Bluethroat nesting in North America a number of years ago. It didn't take us long to get amazingly good looks at three males that essentially flew in circles around us, coming to rest at the top of some of the low willows in the area. Fantastic bird. Now, we got into position for the climb, and ate half of our sandwiches, to give us some energy, saving the rest for our return. Fortunately, we were in good hands with Kevin. He had been here many times, and most times was able to locate the Curlews. Partly that is because this guy never runs out of energy, a power that I don't posses. So there were perhaps a dozen of us looking for the Curlews, and over a relatively short period of time, we began to split up, according to each of our ability to keep moving. As we moved up and around the dome, we did scare up some birds. I almost tripped at one point over a Willow Ptarmigan, who moved around very slowly, giving us excellent views. There were a number of Lapland Longspurs and a couple of Hoary Redpolls around. And we saw a number of Rock Ptarmigan, as well as a couple of Whimbrel, that are often difficult to tell from the BTCU. Finally, someone spotted two birds flying toward us, and as they got closer, we could see the telltale pattern on their tails, identifying them as Bristle-thighed Curlew. YES! At this point, we began to play the game of BVD (Better View Desired), and indeed, by continuing to track the birds in flight, we got to see where they landed, and eventually saw up to 5 birds. Then they flew closer to us, and we got good scope views, and finally a literal armada of them(well, only 11, but it sure seemed like an armada). So, satisfied, we now faced the task of getting back to the vans. When Kevin pointed the general direction out to us, I realized, that I would have likely gone in the opposite direction, had I been here by myself, or without a guide. We all started back, and I stuck with Dave Alexander, a Radiologist from Duluth. It was a long hard slog, but we eventually got back to the vans, where we had the second half of our sandwiches, and plenty of cold drinks, while waiting for everyone else to return. We were all elated, but tired. It would have been understandable if we just simply drove directly back to Nome, but Kevin and Rafael listened for Arctic Warbler all the way back. Everyone came to the conclusion that we were just a little too early this year to find any. We did make a stop on the way back where I found another Wandering Tattler, and we had Golden Eagle as well, but clearly the birds of the day were the Bluethroat and the Bristle-thighed Curlew. The following day was change day. 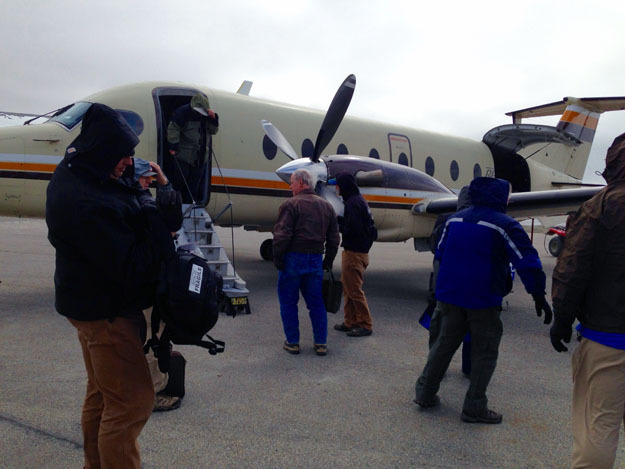 Five of us were on the Air Alaska flight out of Nome at around 11:30, and several new people were coming in to join the tour for the next stage, which would be a repeat of what we had already done in Nome, then on to Anchorage for a few days, before going out to the Pribilof Islands. But we still managed to do a bit of birding the next morning, before returning to the Hotel around 10 to pack. The best sighting of this morning was some nice close up scope views of Aleutian Terns, along with Arctic Terns. Oh, and the other highlight, was a sighting of the "Christine Rose". Inside joke. All in all, this trip really exceeded expectations. I had prepared a list of birds that I was hoping to see. I really missed only Emperor Goose, and Spectacled Eider. Got everything else, as well as perhaps 6-7 birds that I didn't even have on my list. I added 23 new ABA birds, of which 21 were lifers. We had 6 true Asian immigrants (Common Ringed-Plover, Lesser Sand Plover, Wood Sandpiper, Terek Sandpiper, Skylark, and Common (Siberian) Chiffchaff). This last bird, I guess you would be tempted to call the bird of the trip, given that it was the 5th NA sighting of this species, but other birds, more common, were nonetheless right up there, including the Bristle-thighed Curlew, Northern Wheatear, Gyrfalcon, and Bluethroat. Our group was an interesting mix of individuals, and Alaska is truly one of the great destinations I've been privileged to visit. I would certainly like to return one day. The following is a trip report for Michael Retter and Doug Chapman’s trip though Southern and Central California in 2006. Michael wrote it with sections amended and emended by Doug. Yes, Michael was tardy–but we got it done. This is a very tardy trip report for my trip with Michael Retter through central and southern California in early October of this year. *D = lifer for Doug. *M = lifer for Michael. # = ABA bird for Michael. We arrived midday at John Wayne airport in Santa Anna (Orange County). After we picked up the rental car it was straight off to the first birding location! We also noted Song Sparrow, House Finch, Lesser Goldfinch, and (heard only) Wrentit here. We watched a pair of White-tailed Kites forage over the hillside a bit inland, providing us with our first views of what would prove to be an almost constant companion on this trip. Next, we stopped at Upper Newport Bay. Belding’s Sparrow*D was quite common: at one point we had 15 birds in view. Light-footed Clapper Rail*D was heard. We went to a location that is supposedly frequented by terns, hoping to get Doug his life Elegant Tern, but the mudflats seems to be nonexistent. We did however find a large concentration of shorebirds coming in to roost on an island just off the side of the road. It was mostly made up of Marbled Godwits, Long-billed Curlews, Western Willets, and Long-billed Dowitchers, but there were some yellowlegs and a Dunlin mixed in. A fellow birder told us that a Ruff had been seen there earlier in the day, but we didn’t find it. Unfortunately we found only a few distant Common/Forster’s Terns, so it was on to the next spot. A bit over six years prior, I’d seen Nutmeg Munias (Mannakins) at Huntington Beach Central Park, so we stopped there to try to find them, and to check out any migrants that might be around. It’s a famous migrant trap, so always worth a look. It was getting late, and we didn’t’ find any munias, but we did find a pair of Cinnamon Teal. Townsend’s and Hermit Warblers were the only (to us) interesting warblers about. At dusk we stopped at Bolsa Chica. It was getting quite brisk by now, something I didn’t anticipate as it was 85ºF when I left Chicago earlier in the day! Doug did get a pretty bad look at his lifer Elegant Tern*D, but we didn’t see much else of note. A flock of Western and California Gulls. Lots of Willets. Some Black-bellied Plovers. That night we drove to West Hollywood, where we spent the first of a couple nights in a really neat hotel called The Beverly Hills Terrace Hotel. That night we ate at a famous Moroccan place called Tagine(owned by Hollywood heartthrob Ryan Gosling)). It was my first experience with Moroccan food, and not at all what I expected. We didn’t even have couscous. :-) Doug was impressed too, as his experience had been with less authentic style Moroccan. After a fairly late rise (and hearing parakeets of an unknown flavor from the courtyard), we headed west, to Compartes Chocolatier. Doug had been reading about the place and it’s charming confectioneur, so we stopped by for a visit. Jonathan was very pleasant to speak with, and he offered us much in the way of free tastes of his truffles, “love nuts”, and chocolate-covered orange peel. The truffles were amazing. Flavored included lavender and violet crème, ice wine, caramel and seasalt, and lemongrass. We stopped at a local restaurant famous since the 1930s for hot dog's–patrons include everyone in the day from John Wayne to Marilyn Monroe to James Dean, Orson Welles to Marlon Brando to Michael Jackson, and now from Jay Leno, Steve Martin, Betty White, Martha Stewart, Aretha Franklin to Guy Fieri and other well-known celebrity chefs Bobby Flay, Giada de Laurentis and Emeril Lagasse. NO hotdog is better than Pink's. I wish we had one here right now. After our chocolate fix, we drove around Marina del Rey for awhile looking for Spotted Dove. Michael had seen it there years ago, so I figured we had a shot. We later found out they’ve not been there for years, so it’s no wonder we dipped. We spent most of the day today driving around the Hollywood area visiting James Dean sights. Doug has a special place in his heart for Jim, and this trip was as much one for Dean as it was for the birds. We stopped at a spot overlooking LA and the Hollywood Hills and were rewarded with our only Vaux’s Swift of the entire trip. This evening we dined at a really great restaurant called Blue on Black. In particular, I remember the Muscovy breast with German chestnut noodles, and the “tropical soup”: panna cotta swimming in a delicious broth of what I think was pineapple, mango and passionfruit juice, with a couple sprigs of fresh thyme. I can still taste it—very delicious! We drove north towards Mount Pinos today, hoping to find Doug one of his most wanted birds, White-headed Woodpecker. Before we left the neighborhood of our hotel, we found the source of the parakeet sounds: Yellow-chevroned Parakeets. They proved to not be too uncommon. After almost running out of gas(! ), we made it to the base of the Mt. Pinos road, only to find out that fire had recently closed all traffic off of the main highway. Talk about a bummer. We messed around for a bit, trying to find other roads to higher elevations, but they were all closed. We ended up birding the grounds of a forest service station, and got great looks at Oak Titmouse, Western Bluebird, and Oregon Junco. We were walking up the drive to inquire about other roads when a young man in a forest service truck stopped to see if we needed help. Doug asked him if he knew where to find White-headed Woodpeckers, and he shot back a rather confused look. At just that moment I said, “There’s one!” A male White-headed Woodpecker*D flew across the road behind the truck and landed in a small dead tree only 10 meters away. We had amazing looks at the bird for about 10 minutes before it continued off. We couldn’t believe our luck, and it was the only decent look we got at one the entire trip. Since these particular mountains were closed, we decided to drive east, toward the Piute Mountains. On the way we stopped in the Mojave at Galileo Hill near California City. We didn’t’ find anything of note there really, just some Audubon’s and Townsend’s Warblers, and what appeared to be some well-fed Coopers’ Hawks. We then headed up into the Piute Mountains. We’d not planned to stop, but driving through the upper reaches of Jawbone Canyon, a LeConte’s Thrasher ran across the road in front of us. How can you not stop for that?! I’d only ever seen that bird once before, anyway. Though diversity there was poor, we had AMAZING looks at both LeConte’s Thrasher and caniceps Sage Sparrow. I got some pretty gripping photos of both. 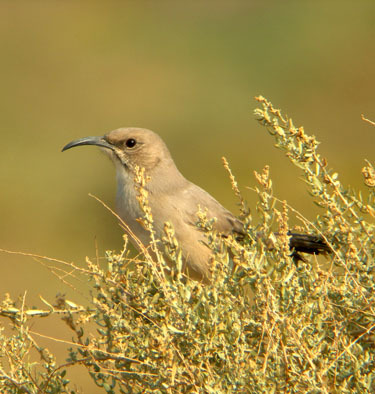 We also saw Cactus Wren there and heard some Chukars on the hillside. A stop an a famous oasis proved a total bust, but a bit further up we entered a high-elevation grassland that was TEEMING with Ferruginous Hawks. I think we saw 6-7 over a 1.5 mile stretch, including prolonged looks at a nice dark morph. From here we started getting into coniferous woods. One of the birds I really wanted to see was Thick-billed Fox-Sparrow, and I figured this was our best shot. It was getting late though, and we had to turn around. As we rounded a corner I saw two very large chicken-like birds jump out of the road up onto the bank. “****,” I thought, “those looked like grouse!” Doug had been wanting to see the newly-split Sooty Grouse, so I had grouse on the mind. We pulled up to the spot, and as Doug will tell you, I went crazy. I was looking at a group of 6 GORGEOUS Mountain Quail, my first-ever looks. (Up until now, I’d only heard them.) I’m told that my voiced went eerily low and that I sounded like “the cello section in the Act IV opening of Verdi‘s Otello.” [A low growl, but of pleasure, not pain.] We watched the birds for a few minutes and ended up splitting up; I tried to go up and around them and push them back towards Doug, but it didn’t work too well! And of course, while I was messing around, Doug saw a Thick-billed Fox-Sparrow*D, the only one of the trip. *grumble*. By this time it was getting fairly dark, and we had a long drive ahead of us, south and west. We spent the night in Santa Barbara – on the harbor. This day started with what was the first of three pelagic trips we took, and by far the most successful, and the most pleasant. Temperatures were relatively warm, the sky was overcast the entire day (good for exceedingly white boys like me), and the birds were great. I was looking forward to the pelagics quite a bit, because they were by only real chance at a lifer. Jaegers stole the show today. Totals were something like 300 Pomarines, 35 Long-taileds, 5 Parasitics, and 12 South Polar Skuas. It seemed like there was always a Pom in view, and usually a few. Black-vented Shearwater#M was the first tubenose of the day. I’d hoped to see it, and Black and Least Storm-Petrels as I’d only ever seen them in Mexico before. Gotta work on the ol’ ABA list! We watched a couple Black Storm-Petrels#M, and then sometime in the afternoon, we got great looks at an Ashy Storm-Petrel*D,M. The captain chased it for a few minutes. It was hard to see through the bumps, but the looks were still great. I’m pretty sure we nearly scared the thing to death. We also had great looks at Arctic Tern, Sooty and Pink-footed Shearwaters, Northern Fulmar, and Red and Red-necked Phalaropes. On the way back into the harbor, Doug finally got a good look at an Elegant Tern, as one was perched atop a buoy. After the pelagic we drove north across the (beautifully moonlit) mountains to Maricopa, where we spent the night. A quick trip outside of town in the morning proved what I wondered: LeConte’s Thrashers still live in the oilfields. We then drove east into the San Joaquin Valley, and thus, saw our first Yellow-billed Magpie of the trip. We birded the Santa Maria area for awhile, hoping to find a Pacific Golden-Plover, but no dice. A quick stop at a small state park did however yield nice looks at a Chestnut-backed Chickadee, at the far S edge of its range. We then drove north through San Luis Obispo and Paso Robles before turning east. We stopped at a couple spots for Bell’s Sparrow and Lawrence’s Goldfinch, but dipped. We did however get very nice, yet distant looks at a Wrentit, enough to see the white eye. We also noted Hutton’s Vireo and Oak Titmouse there. A large (~125) flock of California Quail alongside the road kept us entertained for a few minutes. Our next stop was at a park in Shannon, just west of Cholame. We’d been told about Larry’s Goldfinches there, but we only found a couple Lessers. There was a big flock of migrant passerines present—mostly Ruby-crowned Kinglets and Audubon’s and Orange-crowned Warblers. But there was also a gorgeous male Black-throated Gray Warbler, and we easterners loved every moment of it. For there it was onto Cholame, where James Dean met his tragic death at such a young age. We visited the small store that houses some memorabilia and spent some time at the memorial. A House Finch sang away while we paid our respects, and I think that bird will always be a little more special to Doug now. From Cholame, we went north to Monterrey to spend the night, and to visit with some friends the following day. That night we ate at the internationally known Sardine Factory. We both had Halibut Encrusted with Macadamia Nuts and served over Grilled Pineapple with Garlic Wasabi Smashed Potatoes. It worked really well. Michael really wanted to try abalone, as I had previously stated that it is one of those foods that in my opinion is another chic-chic foodstuff that is more classed as paper maché than anything with flavor, or interesting texture. After a $3500 appetizer of Abalone (very little of it) he agrees now. The restaurant is apparently known for its extensive wine list (definitely the biggest I’ve ever seen), and we indulged in some vintage vino tonight. I can definitely say that I’ll never forget the first time I had Sauternes. I thought we deserved a real treat: a 1955 Chateau D’Yquem. (The year James Dean died.) It was stunning. It was a very special night, and I thank Doug for being such a great friend and sharing that with me. This would prove to be one of the most miserable days of my life—the first time I got seasick. We joined up with a few fellow birders from the Bay Area to go on a pelagic with Debi Shearwater. Before we got out of the harbor, we watched a lingering female Harlequin Duck, and Doug was lucky enough to be one of the few people to get a look at a Manx Shearwater before it flew directly away from the boat into the sun. I was fine for the first hour or so, and got great looks at Black-footed Albatross and Buller’s Shearwater, but then the mal de mer kicked in. The seas were 13-15 feet, and we were headed into the wind, so I suppose if I had to get sick sometime, this was it. Somehow, between rounds two and three of being draped-over-the-stern heaving, I managed to spot the bird of the day (for me at least), a gorgeous Flesh-footed Shearwater*D*M.
It’s true what they say . . . “At first you’re afraid you’re going to die; then you’re afraid you won’t”. I was out for, oh, about four or five hours I’d say, though it seemed like an eternity. It was more than I could do to simply watch the horizon, partly because the horizon disappeared behind the next swell half of the time. I didn’t’ know that body temperature is affected by seasickness, but I found out as I alternated hot flashes and frigid chills for a couple hours. Eventually, I decided that I couldn’t get any MORE miserable, so I closed my eyes and fell to sleep. I’m pretty sure that I woke up every time a bird was called. I remember in particular hearing Debi call “SKUA, SKUA!” I looked up (without binoculars) to see it fly by at fairly close range. I thought to myself. “Yeah, that’s a fricking big jaeger,” and went back to sleep. That was one of eight SP Skuas for the day – not bad. I’m told that I woke up not long after we turned around, and the seas calmed as we headed in with the wind at our backs. It was only then that I was able to do any kind of socializing, and I apologize to all (especially Doug, who concurs) since I was not able to gab a bit more. Immediately after we got back to shore, we made a big decision. We drove southeast, to spend the night in Bakersfield. We ate at a Basque restaurant, where the food was much better than the menu and ambience would have let on. I had tongue and sweetbreads for the first time, and they were both very tasty! Why did we dive to Bakersfield you ask? Well, just see where we ended up the next day . . .
Gary Meyer tipped us off on some Spotted Doves in Bakersfield, and after some work we finally found one. The noisy Rose-ringed Parakeets were much easier to find. Then we headed south—to the Salton Sea. Crazy? Perhaps, but it ended up being worth it in my opinion. We stopped in Indio and bought some delicious local dates — at a gas station! The Indio area is North America’s main date-producing region, so we just had to try a few. We agreed these are so much better than any other date we’ve ever eaten. The reason we drove all this way was for a shot at Blue-footed Booby. The hurricanes of a month or two prior had pushed up ca. five of them onto the Sea, and there was at least one still hanging around, we were told. We spent a couple hours trying to find a point to access the Sea and view the rock the booby supposedly roosted on (and in the process stumbled across a small flock of Lesser Flamingos). Eventually, we called Jennifer, and she steered us in the right direction. But it was much too hot to see anything 1.5 miles away; the heat waves were just too strong. We did however get great looks at a few Yellow-footed Gulls, including one that flew right over the car. As an aside, less than three weeks later, Guy McCaskie found the Salton Sea Ross’s Gull. It was probably there when we were. But, alas, we did not see it. We decided to go look for Ruddy Ground-Doves M# at an old hog farm. It took quite a while, but we eventually got a look at an exceptionally-boring female, but it was ABA bird 672 for me, so I can’t really complain. Back at the booby spot, we eventually prevailed. A crappy look, but definitely a Blue-footed Booby – an ABA tick for both of us, and a lifer for Doug. We then spent an hour or more fruitlessly searching for my other most-wanted bird of the trip, Large-billed Sparrow. Water levels seemed to be down, as there was no vegetation close to the waters edge, so we had no idea where to look. We went to the spot Doug had seen them two years earlier. No birds there at all. We left feeling somewhat defeated but also pretty pleased with what we’d accomplished for the day. Thus began our 3.5 hour drive to Ventura (not nearly the six hours we’d been told it would be). This morning we woke up at the hotel that ABA was using as the site for its 2006 Regional Conference. We joined them for one morning and headed out to Santa Cruz Island to see the jays. On the way, we had amazing looks at a juvie Sabine’s Gull. We also came across a flock of a few thousand Black-vented Shearwaters, which made for good studies of variation in plumage in this variable species that seems to be especially prone to leucism. The jays were a bit skittish, undoubtedly due to the group of 50 people roaming about the island, but we eventually got good looks at Island Scrub-Jay*D. On the rocks around the island we had really nice looks at Black Oystercatcher and Black Turnstone. The endemic Santa Cruz subspecies of Allen’s Hummingbird was seen well, too. On another pelagic, we birded the same waters as the trip four days prior. The difference in birdlife was amazing. We saw perhaps 50x as many Black-vented Shearwaters, but no storm-petrels at all and only about 5 jaegers total! Back ashore, an incredibly nice local (Wes Fritz from Solvang), took us to go look for a Pacific Golden-Plover*M he found earlier in the day at a sod farm. After a bit of work, we had some prolonged views, but through a shroud of water. The bird was feeding in a flock of Black-bellieds on the “other” side of an array of sprinklers. We spent a good 30-40 minutes with the bird, and eventually formed a good image of what the whole bird looked like from the bits and pieces that were visible at any one time. It was ABA bird 674 for me—almost to my (I’d thought unattainable) goal for the trip. As an aside, I reached 675 in Texas last month with a Northern Jaçana (zhah-sah-nah!? ), only to come home to the latest issue of Birding and see that Yellow-chevroned Parakeet was removed from the ABA list—back to 674! Our last bit of birding was at Sycamore Canyon, part of Part of Pt. Mugu State Park. Though we only birded here perhaps an hour, it proved to be one of my favorite stops of the entire trip. We got incredible views of Nuttall’s Woodpecker, Wrentit, Anna’s Hummingbird, and Golden-crowned Sparrow mere feet away. A special moment for me was watching a Wrentit fly up and grab a little white berry that perfectly matched its eye! We ended the evening with a surprise: a pair of Black-hooded Parakeets that came screeching down the canyon. I’d heard that they nested there but had completely forgotten. After enjoying some delicious German food, we spent the night in Oxnard. We flew out of Oxnard this morning to LAX, and then home. California Dreamin’ all the way. Both the food and the birds will remain long with both of us. On a personal note, I had an amazing time on this trip with Doug. I think we became much closer friends, and I want to thank him profusely for all the kindness he showed me over the week—and the patience he’s shown with me finishing this trip list. If you haven’t met Doug, you’re missing out on knowing an incredibly kind, light-hearted, fun individual. I can’t wait ‘til the next trip; I just hope others of you will be able to join us! Thanks, Michael. It was indeed a very good time: food companion and birds!  This section of the South Dakota Ornithologists' Union website provides a place for members to share their stories of birding adventures within the state and beyond as well as publish other short items of interest that may not fit the criteria for South Dakota Bird Notes. You must be a member in good standing to write a post which is then approved by the administrator before it becomes public. Be sure to add a few photos to your entry! With continual contributions from the membership, this may become a living newsletter for SDOU. Any opinions expressed herein are those of the poster and do not represent the South Dakota Ornithologists&apos; Union.